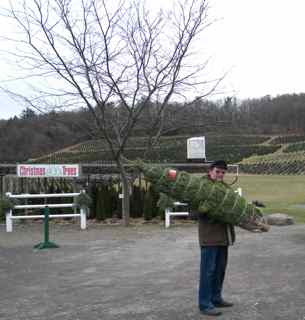 Even before we went to the tree farm back in mid-December, and before the ground froze, H.H. drove a metal stake into the lawn. 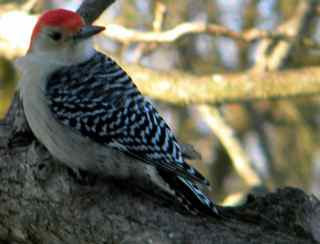 He located it where it could be seen from the French windows in the garden room. He would plant the used Christmas tree on this stake when the holidays were over. This season we chose a fine Douglas Fir that perfectly fit our small den. Old Homstead Tree Farm has lots of trees to choose from. H.H. carried it to the truck. 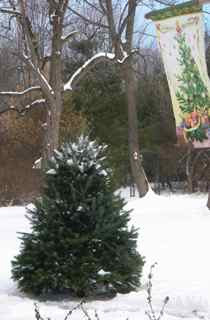 When the festivities were over for another year, HH placed the tree on the aforementioned spike in the lawn. It is appropriately located under a garden flag that depicts a Christmas tree. 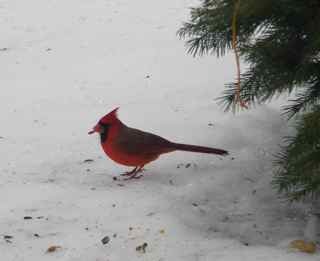 In the winter, when my garden is covered with snow and there are no blooms to enjoy, the birds come into their own. 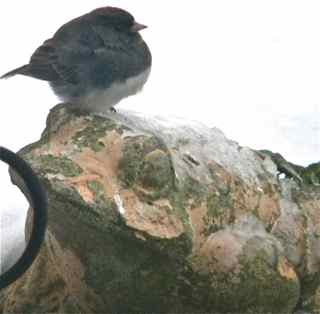 From my favorite chair in the garden room, I can watch, to name just a few: woodpeckers, juncos, cardinals, wrens, titmice, pine siskins, and adorable bluebirds. 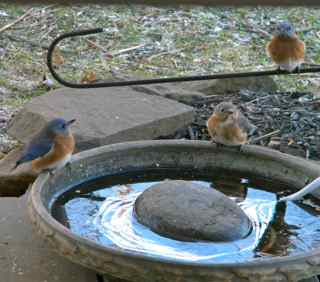 Bluebirds visit the heated water dish every day. I love making treats for my darling avian friends, so I gathered the materials to make decorations for the tree: peanuts, peanut butter, bird seed, and yarn. I strung the peanuts to make garlands. After making a yarn loop for hanging the cones, I spread them with peanut butter and dipped them in birdseed. 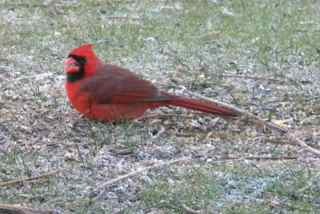 Peanuts for the birds. 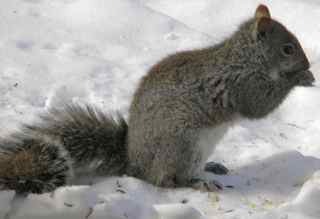 But will the squirrels get them first? 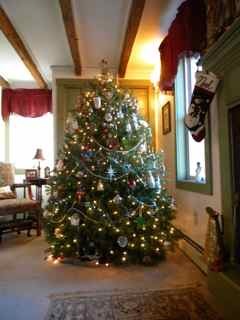 I braved the cold to dress the tree in its new finery. Boy, was it cold!! 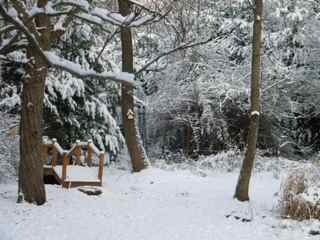 Then I went indoors, camera at the ready, waiting for the birds. 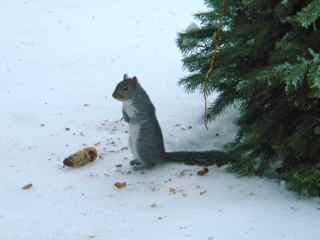 I was not a bit surprised when the squirrels found the treats first. They pulled some of the goodies down to the ground. 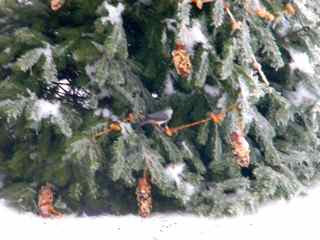 Several birds preferred to eat from ground level rather than land on the branches of the tree. 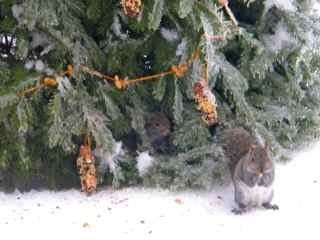 Can you see Pesky Squirrel peering through the branches? He soon pulls some cones off the tree! 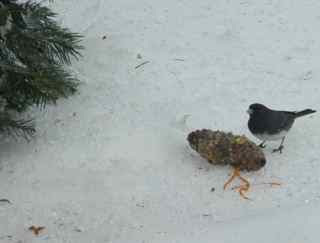 The Junco enjoys eating seeds from a fallen cone. 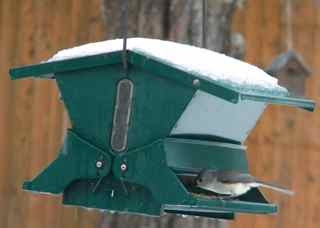 Look closely and you can see a titmouse on the peanut garland. 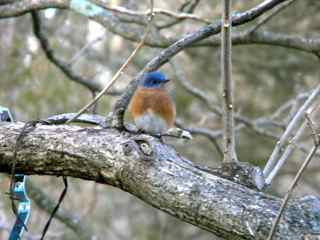 The bluebird was not so sure and stayed in the catalpa tree. 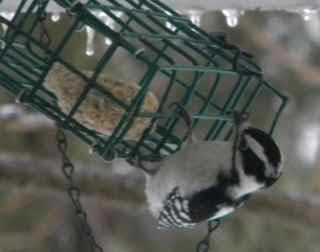 As I finish writing this post, the squirrels are busy destroying my handiwork, but there are plenty of birds enjoying it, too. I will use this post for Saturday's Camera Critters hosted by Misty Dawn. Click on the banner in the sidebar for more information - I urge you to join in the fun! For me there is only one answer to the Camera Critter's question, If you could do anything for a living, what would it be? - I just want to continue enjoying being retired!! Happy 2011! I am not very good at keeping new year's resolutions, but I enjoy making them, as I love new beginnings. 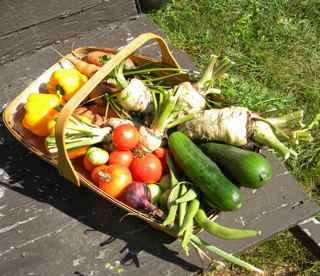 So when I received an email from our local newspaper, The Pocono Record, asking for my new year's gardening resolutions, I was ready with an answer. I told Marta, the editor of the 'Home and Garden' section, that I have two main ones: to try square foot gardening and to garden wiser by simplifying. I have been reading Mel Bartholomew's All New Square Foot Gardening. 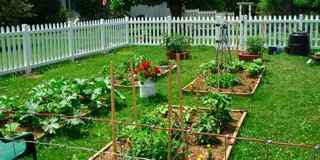 Growing more in less space appeals to me and I am anxious to put some of his ideas into practice in my vegetable garden. I feel my 8' x 4' raised beds lend themselves to this type of gardening. As the seed catalogs arrive, I am seeing my vegetable-garden plans in a whole new and exciting light. 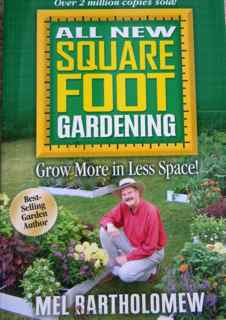 I would love to hear from other garden bloggers who use or have tried the square foot gardening method. Simplifying is going to be more of a challenge. 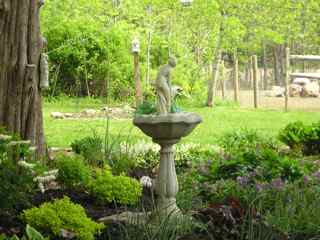 Sometimes I feel I have 'created a monster' out there with too many gardens to take care of now I am in my 70th year. 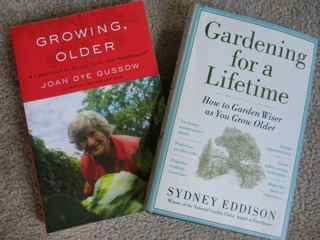 I read two books that influenced me in my decision to garden wiser: Sydney Eddisons, Gardening for a Lifetime and Joan Dye Gussow's Growing, Older. Both authors are AMAZING, with brilliant insights into the practice of gardening and their philosophy of gardening. I recommend these books to all of you, whatever your age. Actually, it was in a blog that I first heard about these books, but I can't remember whose blog it was. I am sorry I have not given you credit, and if you read this, please let me know who you are. 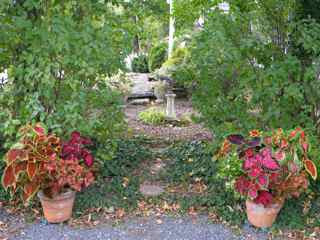 Replace high maintenance plants with low maintenance ones. Give minimum care - that means being realistic about what I can do. 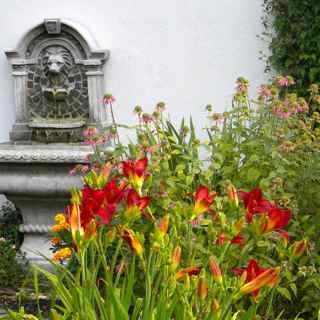 I will begin by taking stock ... examining each flower bed as I walk around the gardens. Right now they are blanketed with snow, so I am looking at the (simple) plan I drew of each one. Where I find plants that take up too much time, I will remove and replace them with lower - maintenance plants. I know I have younger gardening friends who will be glad of the gift of some of my more aggressive blooms. 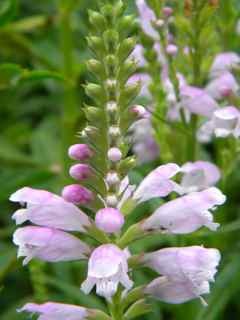 For example, every spring I need to dig up large amounts of goosenecked loosestrife and obedient plant. Otherwise, these thugs would soon take over the whole garden. 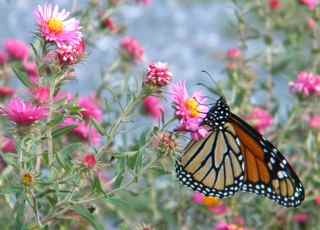 I have already removed the high maintenance New England asters that succumbed to various diseases every year since they were planted. You can read about this task here. I am replacing them with shrubs. 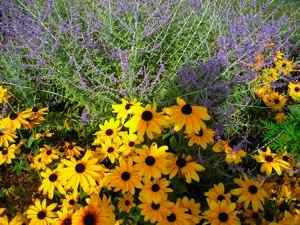 Other low maintenance plants I intend to use more of are sedums, rudbeckias and daylilies. Also, spring bulbs are so very reliable! 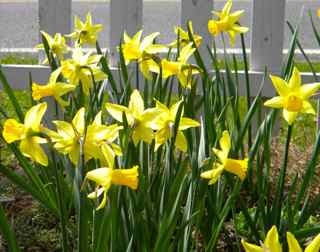 This fall I planted many more daffodils - can't wait for spring! Shade gardening is definitely less work than any other. 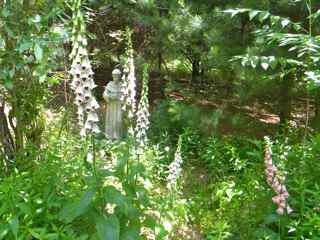 I really appreciate my woodland garden and the shade garden close to my house. 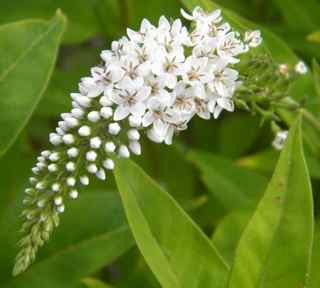 Shade garden plants are very low maintenance, especially native ones. 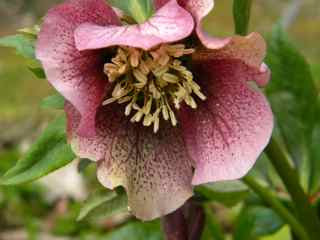 My favorite shade garden flower is the hellebore. I plan to plant more of them this year. I am learning more-and-more labor-saving techniques and I hope to write a post about them in the future. For example, using containers is a great labor-saving method. Almost anything will grow in a container. Eddison recommends we get help as we get older. This can be expensive, so I am fortunate in having HH who does more and more each year to make my task easier, even though he doesn't know a weed from a prize bloom. (I think I was very wise to marry a man younger than me!) In my efforts to simplify, I must learn to accept imperfections in my garden. I need to be realistic in giving the garden a minimum level of care. 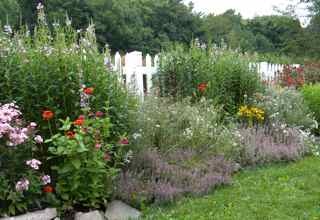 I have to assure myself that when visitors come into my cottage garden, they wont notice a few weeds. This is a difficult one for me. Now I am wondering what YOUR new year's resolutions are? 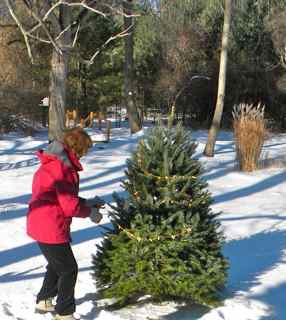 If you have not made any yet, you can read Marta's article, Monroe County Master Gardeners Make Their Resolutions, in the Pocono Record for some great ideas from the master gardeners in my district. Again, I wish you health, happiness and great gardening in 2011!